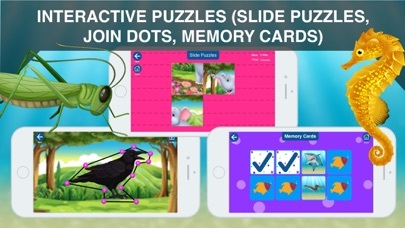 All In One Kids Puzzle includes 6 fun activities: Play Jigsaw Puzzles, Join the Dots, Memory Cards, Slide Puzzles, Word Mania, Spelling Game are packed into this one great app for your kids. 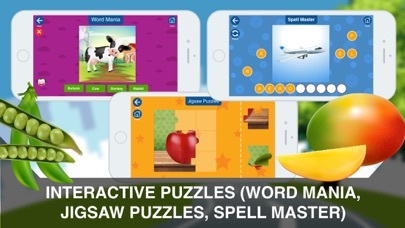 This educational and fun App helps young children learn the phonic letter sounds and simple words while teaching matching skills, memory skills and hand eye coordination. 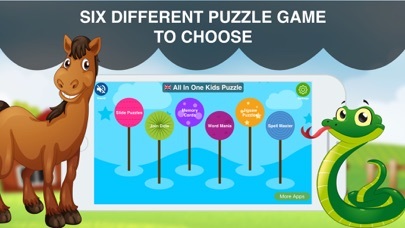 All In One Kids Puzzle have traditionally been a fun and early education learning tool for tots, toddlers, preschoolers, kindergarten, and early school age children and are a stimulating game for girls and an exciting game for boys. We hope you and your children enjoy playing what we believe is one of our best early education games for toddlers and preschoolers. - Custom settings to fit every kid. 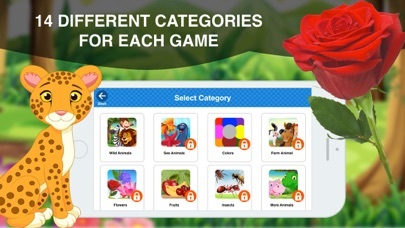 - Covers most common Birds, Body Parts, Colors, Farm Animals, Flowers, Fruits, Insects, More Animals, Musical Instruments, Sea Animals, Shapes, Vegetables, Vehicles, Wild Animals that children love as well as some lesser known ones. If you like this game and would like to purchase the rest, you can unlock the entire app with a single in-app-purchase. Give some time to write review and rate us, we love to here for you.